Sit down with some hot cocoa, a kitty, some “wicked big” handspun, and get ready to knit up something bright for the holidays. This is a pretty easy pattern that will work well with any super bulky thick and thin yarn for a fun afternoon project - the bigger and brighter the better! 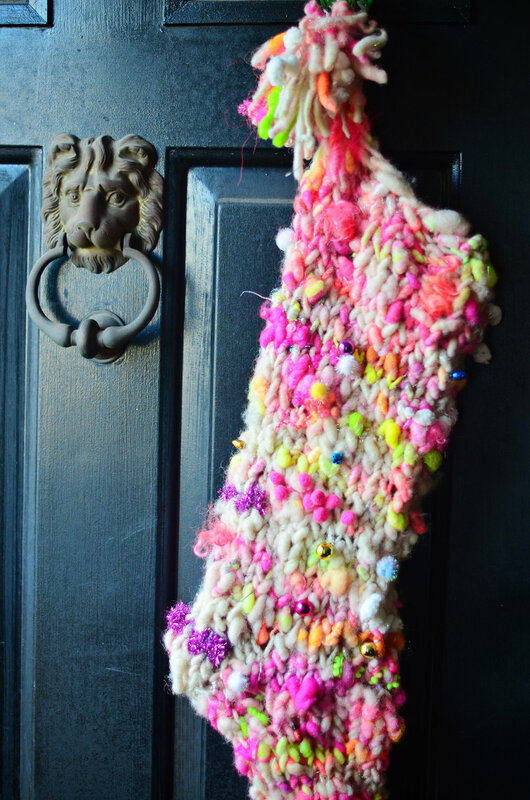 I used two large skeins of matching corespun neon yarn with jingle bells, mini pom poms, tinsel, and X-mas baubles spun in. There’s a simple ribbed cuff at the top and the rest is straight knitting. I started with circular needles and switched to DPNs for the toe, but you could use whatever you prefer. 2 Skeins Super Bulky Yarn (about 80-100 yards). 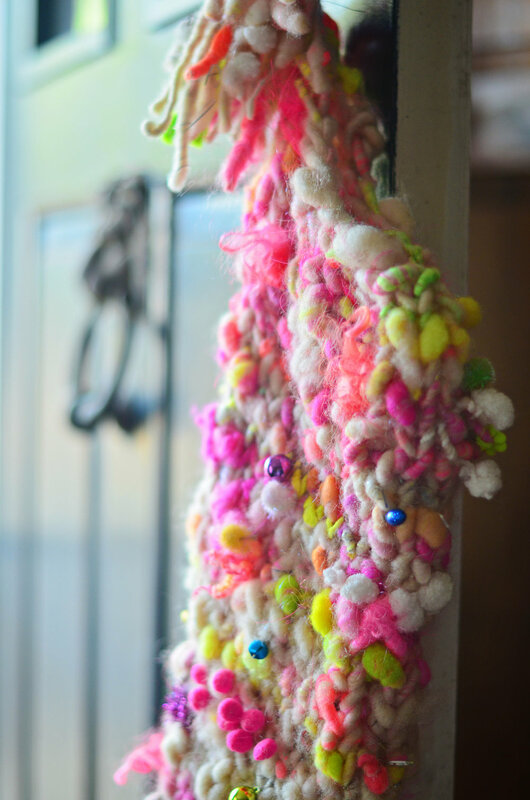 Using 222 Handspun Neon Super Bulky Corespun Art Yarn. Gauge: 5 stitches / 4"
Using Long Tail cast on, cast on 20 stitches. Place stitch marker. Row 2-5: Repeat Row 1 (K 2, P 2) knitting in the round for about 5 (about 4 inches long). K 20. Continue knitting in the round until stocking is about 16 inches long. Row 1: K 8 stitches. Place a marker on right needle and turn work. Row 2: SL 1 as if to purl, P to the end (7 stitches), turn work. Row 3: SL 1 as if to purl, K to the end, turn work. Row 4: SL 1 as if to purl, P to the end, turn work. Row 5: SL 1 as if to purl, K to the end, turn work. Row 6: SL 1 as if to purl, P to the end, turn work. Row 7: SL 1 as if to purl, K 2, K2TOG, K1, turn work. Row 8: SL 1 as if to purl, P2TOG, P1, turn work. Row 9: SL 1 as if to purl, K2TOG, K2, turn work. Row 10: SL 1 as if to purl, P2TOG, P2, turn work. K2. Placing marker in middle of heel. K2. Pick up stitches of heel side (3 stitches). Do this by placing needle through both legs of the V, wrapping, and pulling through onto needle. Add stitch marker. Then continue to knit in the round towards back of heel marker (10 stitches). Pick up heel gusset stitches in the V (3). K 2 to back of heel marker. You can mirror decrease down again to 14 stitches starting 3 stitches from center heel marker. K all around for 5 rows. Transfer to DPNs starting at center heel marker. Use Kitchener stitch to close toe stitches together. Weave in ends with tapestry needle. Attach pom poms or tassels to the toe and cuff. 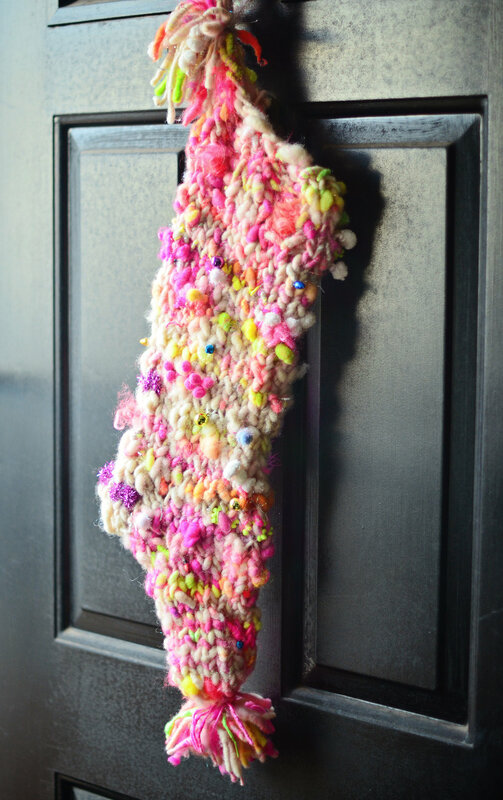 You can knit an icord from leftover yarn to use as a hanging loop. Block if you like, or don’t if you can’t wait to show it off to all your friends. Oh, and please make sure to not leave unattended with your furry creatures or offspring. © 2016 222 Handspun. All rights reserved.